In part I of this article series, we discussed the sources of inoculum for fruit infection by the brown rot pathogen, Monilinia fructicola (see July 21, 2015 article). 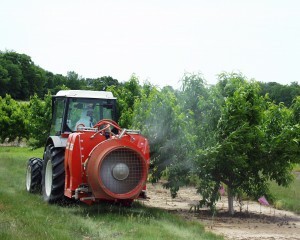 Air-blast application of fungicide to peach. Although measures to reduce the inoculum from these sources were presented, these cultural controls alone only provide partial control. They are to be used in conjunction with other measures in an integrated program. And every facet of this program needs to be fine-tuned for optimum performance, especially in a wet growing season. Of all components in an integrated brown rot management program, the application of fungicides provides the most flexibility. As an applicator, you have complete control of what material to apply, the frequency of application, the rate of application, the volume of application, and the spray method. You even have control over the type of sprayer, although air-blast is assumed for this article. Below are recommendations for obtaining optimum performance from a pre-harvest fungicide program. Discussion on some components, such as spray materials, are specific to brown rot control. However, most factors apply to fungicide application in general, and so these optimizations are also pertinent for control of other fungal diseases, such as scab or rusty spot. Finally, note that the recommendations are set to achieve maximum disease control. As a grower and business owner, you ultimately will need to determine if any added expense of the control measure makes sense in terms of profitability and sustainability. Spray Volume. Full dilute sprays on peach, which is about 200 gpa, is essentially applying to the point of “run-off”. The spray material is literally dripping off the tree. Although this volume provides 100% coverage at the time of application, it is not practical. If you have considerable acreage to spray, too many re-filling trips are needed. Conversely, if you have only a dozen or so rows of peaches, as with some farm markets, this volume might be possible. Any volume less than full dilute is considered ‘concentrate” and relies on subsequent rains to re-distribute the fungicide to tissue not originally hit as well as newly formed tissue. The higher the concentrate volume the better the coverage because more tissue is hit at spray time. A spray volume of 50 gpa should be considered the minimum for peach, while 100 gpa is the recommended volume. Under very heavy disease pressure in our trials at RAREC, we regularly obtain >95% control at 100 gpa. Spray Method. When properly executed, excellent brown rot control should be possible with either alternate row middle (ARM) sprays or full sprays. The challenge is to match the spray interval with the infection risk. If the risk is high (e.g. much inoculum and/or frequent rains), then a shorter interval is obviously better. Ideally, ARM sprays should be at half the interval of full sprays, so that after two half sprays, the same amount of material per acre would have been applied over the same time interval. So, for example, if full spray timing is 7, 10, or 14-day intervals, then half sprays should be at 3.5, 5, or 7 days. “Stretched” intervals could result in gaps in coverage, regardless of which method is used, and is not advised for high risk seasons. Preharvest Spray Intervals. Preharvest fungicide programs for brown rot control can either consist of two sprays or three sprays. Two spray programs are best used early in the season, when disease pressure tends to be lower, or anytime during the harvest season in dry years. Applications at 14- and 7-days is usually adequate for these situations. However, in both cases, a final cover spray of captan at 21-days preharvest is recommended, especially if the earlier covers were sulfur. If frequent rains continue throughout the summer and harvest season, then a three-spray program is highly recommended. The recommended timing for this program is 18-, 9-, and 1-day preharvest, with a final captan cover spray at 28-days preharvest. Note that the final preharvest spray can be applied immediately before the first picking, or alternatively between the first and second picking; the idea is to provide protection throughout the handling process. Of course, the fungicide used at this time must have a 0 or 1 day PHI and appropriate REI. Preharvest Fungicides. The relative efficacies of currently available fungicides for control of brown rot fruit rot are listed in Table 6.4 (p. 91) of the 2015 New Jersey Commercial Tree Fruit Production Guide. Only those fungicides listed as good or excellent should be chosen for the preharvest sprays. For resistance management reasons, a minimum of two different chemistries should be applied to each cultivar block (alternated). However, use of three different chemistries is strongly recommended given that some of these chemistries are rated at high risk for development of resistance. An excellent three-spray program that utilizes all three chemistries is Gem, Indar, and Fontelis. For those fungicides composed of two active ingredients, simply alternate with the third chemistry. For example, if you wish to use the highly effective Merivon or its precursor, Pristine, then your three-spray programs could be Orbit, Merivon, and Indar or Pristine, Indar, and Pristine. In the first case the chemistries are, respectively, DMI, QoI+SDHI, and DMI; in the second case the chemistries are QoI+SDHI, DMI, and Qoi+SDHI. As you progress through the harvest season spraying different cultivar blocks, simply continue with the rotation. Fungicide Rate. Many fungicide labels provide a rate range rather than a single rate. These labels often indicate that higher rates should be used when conditions are very favorable for disease development. While this usage makes sense and should certainly be considered, keep in mind that rate interacts with a number of the other spray application factors. For example, applying a higher rate using a low spray volume may not provide the expected improvement given the lower degree of coverage. In general, a good starting point is the middle of the rate range, using somewhat higher rates but not necessarily the maximum as conditions become more disease favorable. The DMI fungicides are a special case in that using higher rates is also a resistance-management tactic. In this regard, note that Indar has an EPA 24(c) special local needs registration in New Jersey allowing application up to 12 fl oz/A; the recommended rate for Indar is 9 fl oz/A. In the final part III of this article series, we will examine crop-related factors that influence brown rot disease development as well as some additional fungicide-related factors.